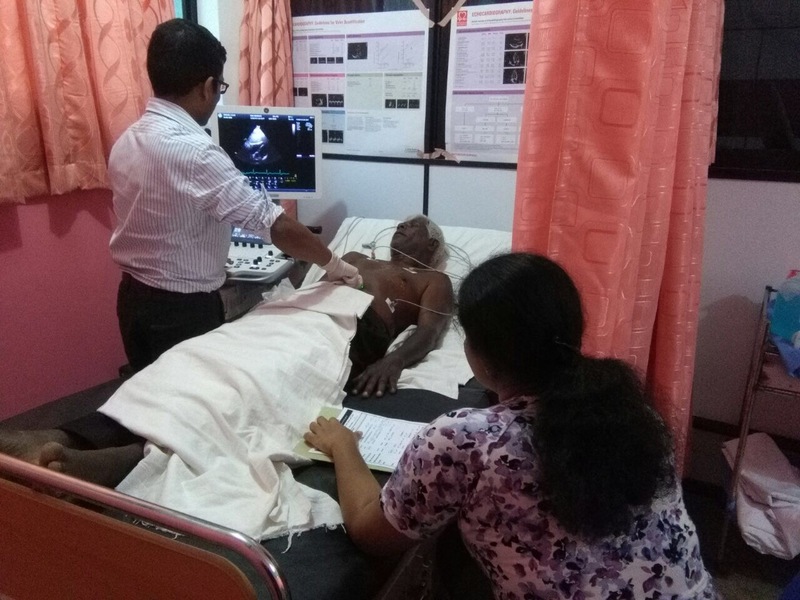 Our 3rd cardiology and Echocardiogram clinic in Mannar District Hospital was conducted by Dr Mayooran Shanmuganathan between 12-15 Feb 2018. 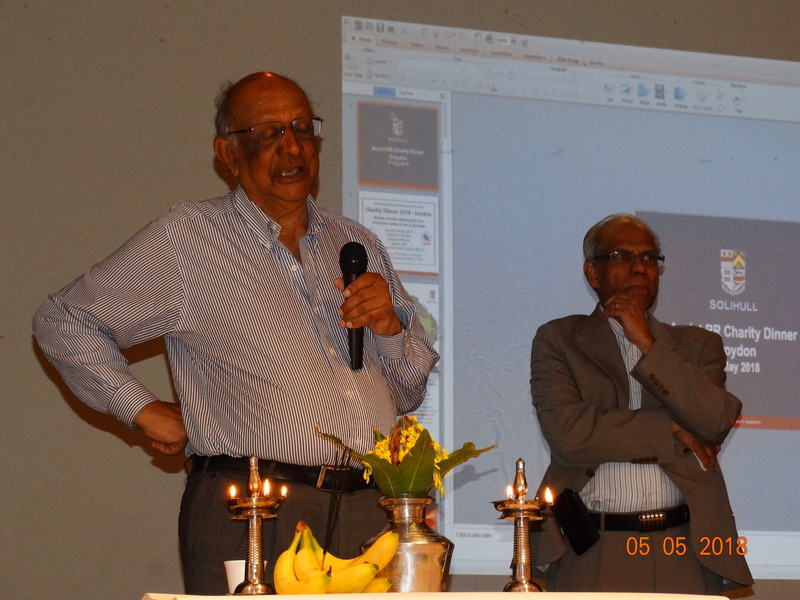 During this trip, he assessed, treated and referred for appropriate follow up a total of 125 patients. Needless to say, these patients would have to otherwise wait a long time and face considerable inconvenience to attend the nearest cardiology clinic in Jaffna or Vavuniya. 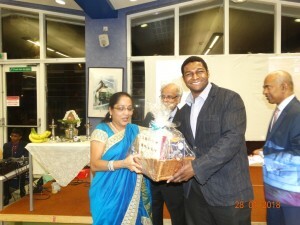 The feedback was very positive from patients and local healthcare professionals. 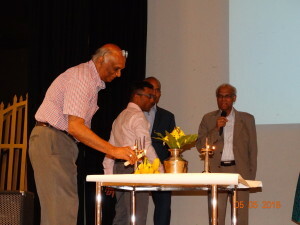 A ceremony to thank our efforts was held by Dr Roy, Assistant RDHS of Mannar District and was attended by the Hon Health Minister of Northern Provincial Council (NPC), Dr Gunaseelan. Assist RR would like to thank Dr Mayooran, Mannar Hospital administrators and nursing staff, Dr M Guruparan, supervising Consultant Cardiologist from Jaffna Teaching Hospital, Dr A Ketheeswaran, the Secretary of Ministry of Health of NPC, and the donors, who have supported us https://mydonate.bt.com/fundraisers/echoclinicsrilanka, for their continued support. Assist RR’s vision is to provide constructive help to the existing healthcare infrastructure in Sri Lanka. With regards to cardiology care, we will aim to extend our help to other districts in the Northern Province which do not have the services of a visiting cardiologist. 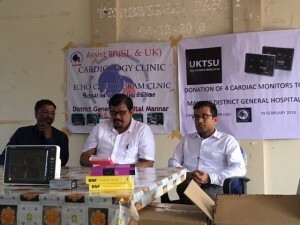 The reason, why we are concentrating in Mannar only, is that an echocardiogram machine is available in Mannar but there are no cardiologists in this hospital, who can use the machine. 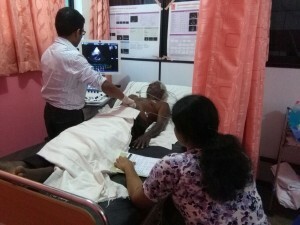 We are unable to extend this service to Kilinochchi or Mullaithivu because an echocardiogram machine is not available in these hospitals. 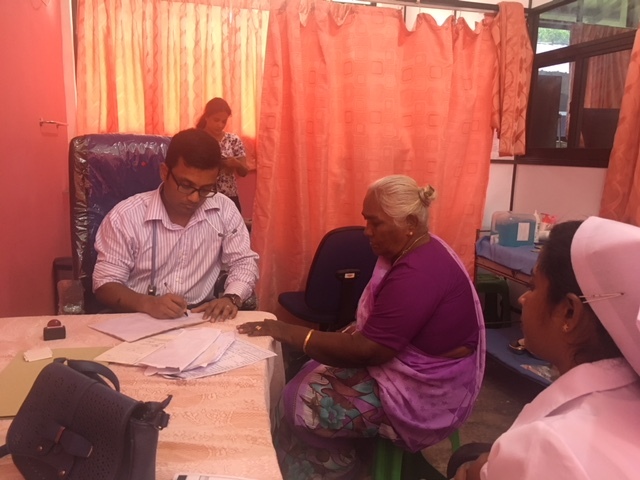 We are very keen to provide this service to patients in Kilinochchi and Mullaithivu and are hoping that we will achieve this in the future. Please spread the news and offer your support. 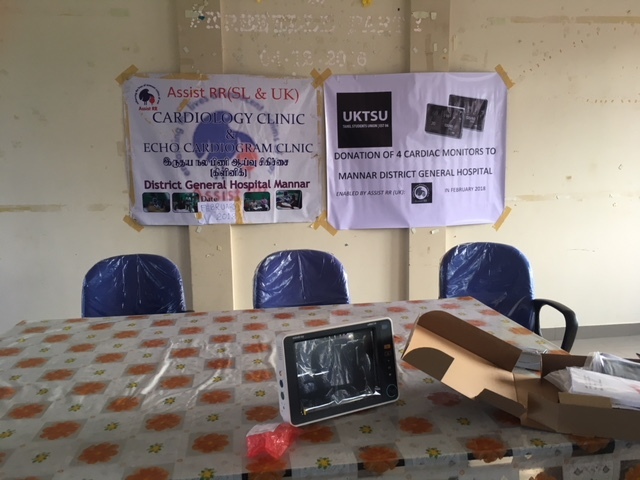 We also enabled the purchase and delivery of 4 patient cardiac bedside monitors (equipments that monitor sick patient’s blood pressure, ECG, heart beat and Oxygen levels) donated by UK Tamil Students Union (UKTSU) worth £3250. 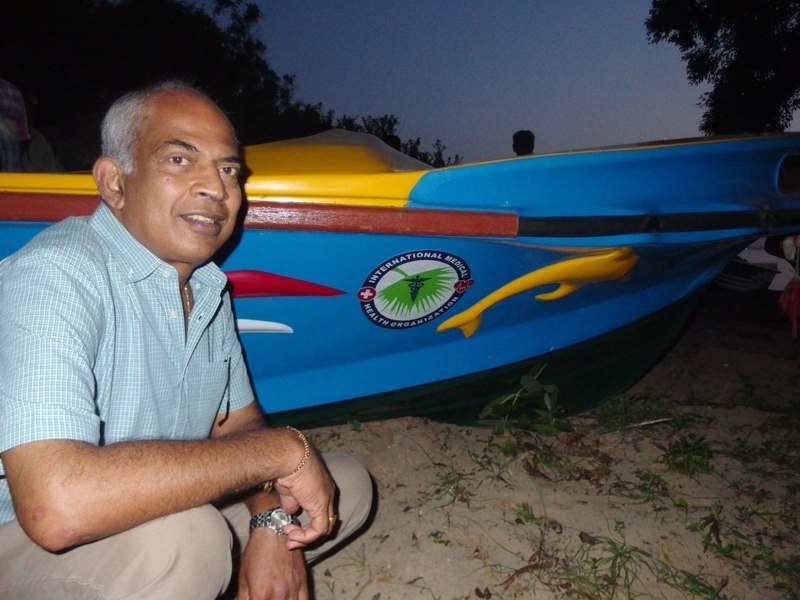 The need for these equipments in Mannar was vey apparent and was noted by Dr Mayooran on his previous trips to the Hospital. Thus when he contacted UKTSU for help, they duly obliged. 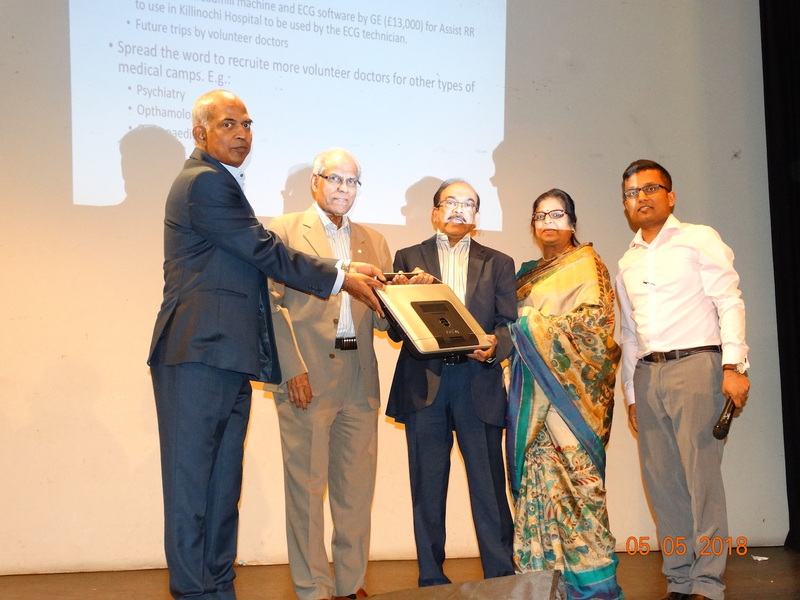 We thank UKTSU wholeheartedly for the timely donation. 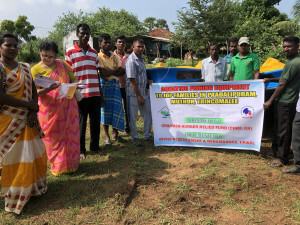 Tamil Aadivasi families (Kuhani Palamkudi Makkal) live in 11 villages in Muthur Division of Trincomalee District. Following a request from Australian Medical Aid Foundation, Assist RR visited these villages in June 2017 and carried out a need assessment. These families were displaced in 2006 and became IDPs. 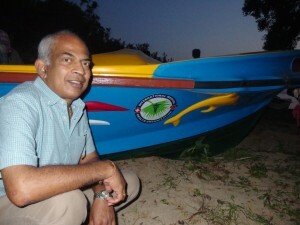 They were resettled in 2009 in alternative lands. 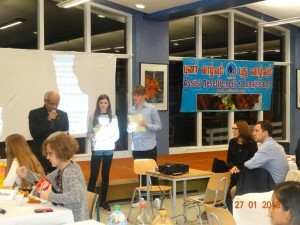 Although they were promised all the facilities, they are living in very sad conditions. Their livelihoods are farming, collecting honey and firewood, hunting, and fishing. These families are not given Samurthi hand outs, although all these families live below poverty lines. They are struggling for their survival due to lack of support. Some mothers do go begging in nearby towns. They desperately need assistance to improve their livelihood. Further to our appeal in July 2017 to help these families, Children Hunger Relief Fund (CHRF, UK) came forward and donated funds to purchase 2 engine boats and nets at a coat of Rs 550,000 per set. 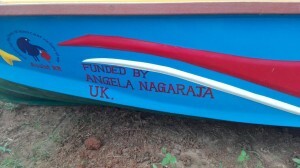 One of these two boats was funded by a generous and kind hearted donor from the UK, Miss Angela Nagarajah in memory of her grandmother Mrs Nagamma, through CHRF. 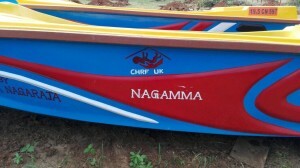 Each boat is shared by five families. 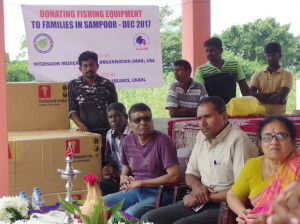 Boats were handed over to the families on 29 Dec 2017. 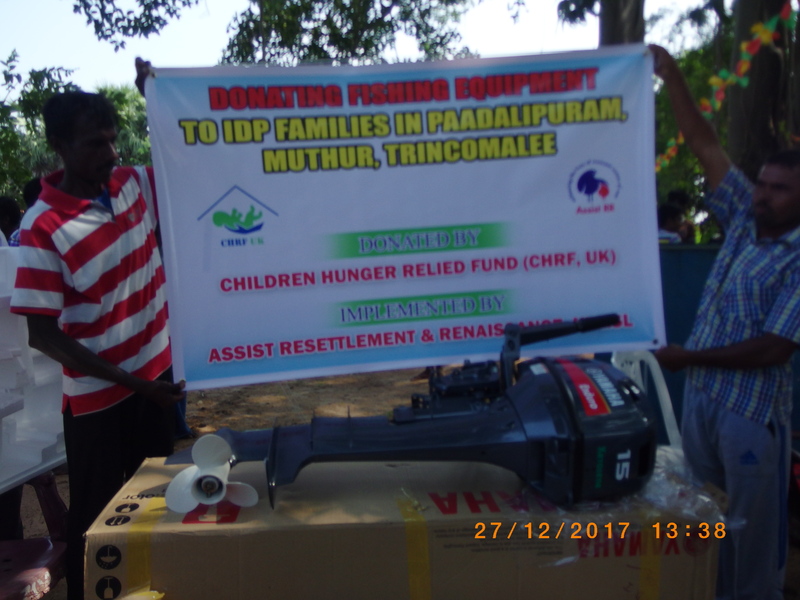 We would like to thank CHRF, UK, for coming forward and assisting 10 families from these deprived villages to stand on their own feet. 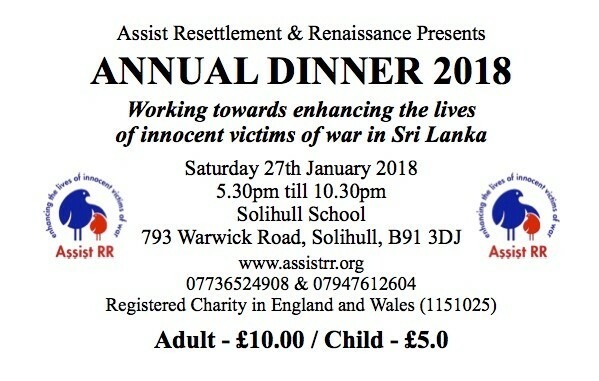 Our annual dinner 2018 was held at Solihull School on 27 Jan 2018. 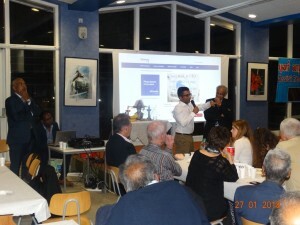 We were hoping to raise maximum £4000, as we have done in the past. 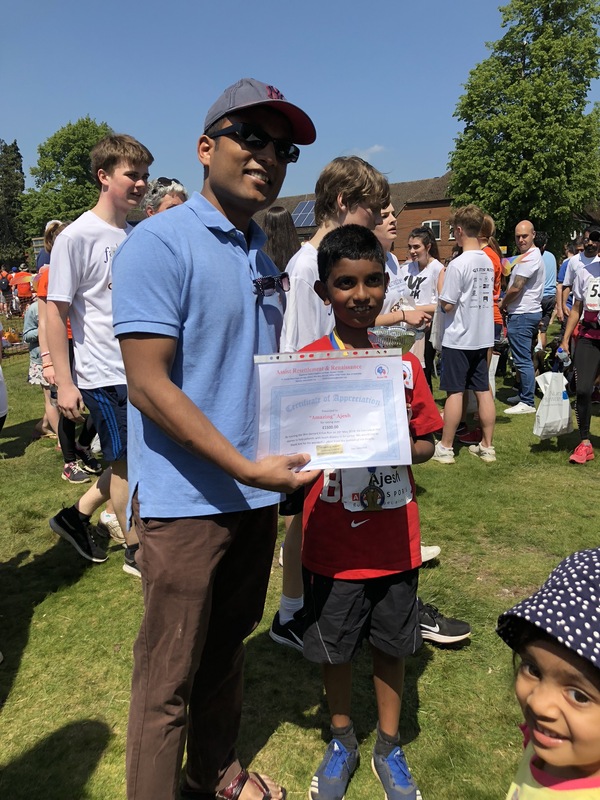 However, final accounts show that we have raised almost £16,000.00, which includes pledged funds for 11 shelters in Sampoor at a cost of £600 per shelter and £4000 raised by an American Auction of a TV donated by a Solihull School family. 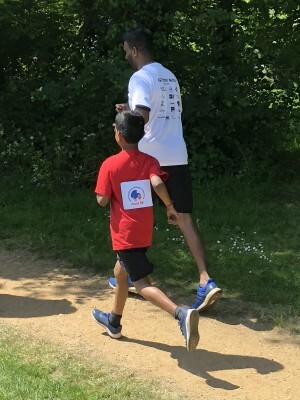 Total raised also includes ticket sales, donations in addition to the pledges for shelters, raffles and gift aid on donations. 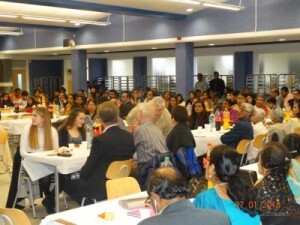 Please note that all the dinner expenses were met by our charity members. 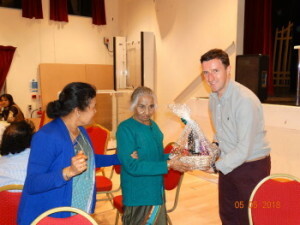 When we were considering holding our annual dinner in and around Birmingham, Solihull School volunteered to host the dinner and allowed us to use their refectory for free. Our guests hugely appreciated this fact and were delighted to be able to use the venue – it proved to be a perfect fit for what we needed. The tremendous support from Solihull school over the years has enabled us to improve the education of thousands of children in areas where schools were destroyed or damaged by the war. It also enabled many hundreds of elderly and vulnerable people to regain their eye sights all over Sri Lanka. We have no words to thank Solihull School and the school community adequately for their continued support. 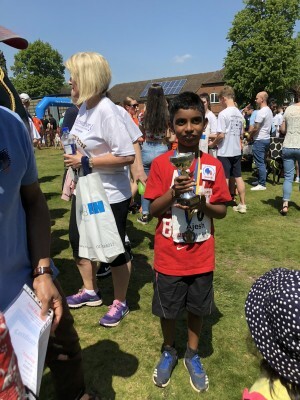 On behalf of Assist RR, we would like to express my sincere gratitude to Solihull School Community. 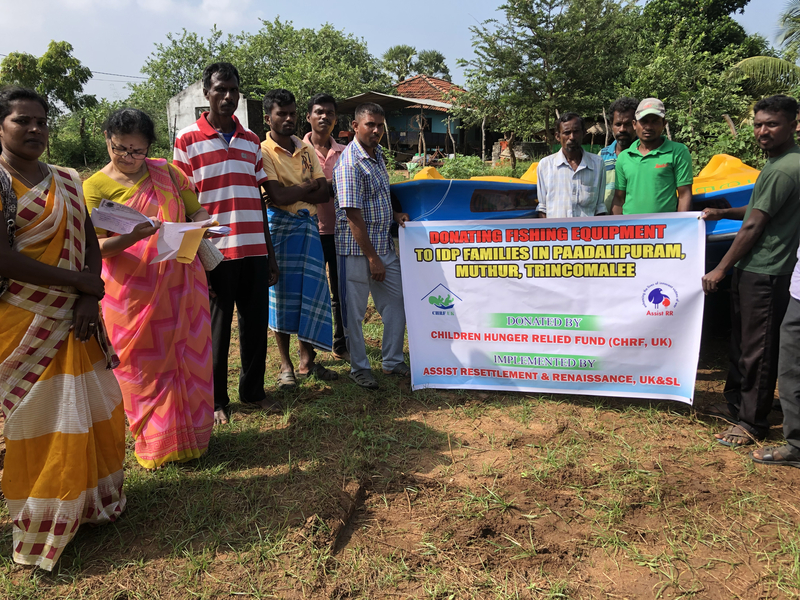 Assist RR have been working in Sampoor, Trincomalee District, providing shelters, toilets and livelihood assistances, with the partnership of many kind hearted individuals and like minded organisations around the world. 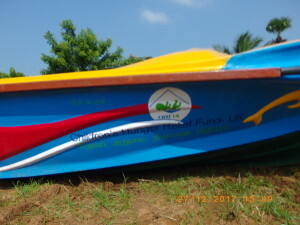 As part of livelihood support, IMHO, USA, provided funds to purchase 5 sets of engine boats and nets, which were handed over to the beneficiaries on 23rd Nov 2017 and 27th Dec 2017. 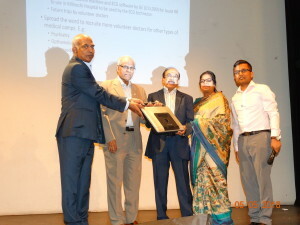 Dr Rajam Thevendran, IMHO, USA and her husband Dr Thevendran from New York, and Henry Aamlaraj, President of Assist RR (SL) attended the handing over ceremony on 27th Dec 2017. IMHO, USA have already funded another 5 sets of engine boats and nets that were handed over in June/July 2017. 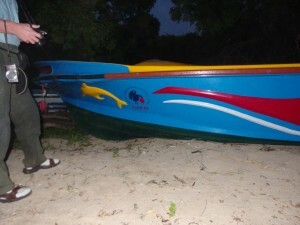 Each boat has been successfully shared by 5 families. 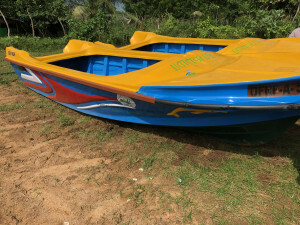 This meant 50 families are being benefitted by these 10 sets of engine boats and nets (costing nearly Rs 5.5 Million) funded by IMHO, USA. 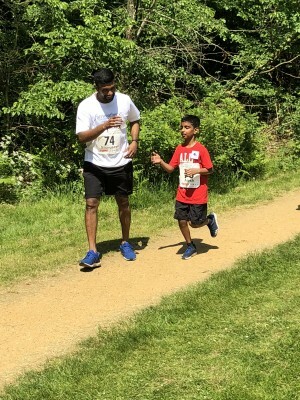 Assist RR would like to inform you that IMHO USA have already funded 119 shelters to Sampoor IDPs at a cost of Rs 14.28 Million (around $95,000). Assist RR, on behalf of Sampoor IDP families, would like to express its gratitude to IMHO USA for their continued support to enhance the lives of Sampoor families.